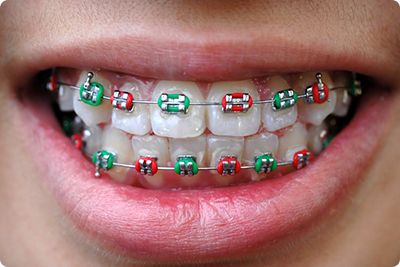 Webster Groves MO Orthodontist Answers: What Does Your Braces Rubber Band Color Say About You? Embracing the journey to prime dental health can be bright and cheery. The great investment of braces can be a fun process. Our Webster Groves MO orthodontist understands that braces will become part of your day-to-day appearance for as long as 18 to 24 months. They will become a part of your style, just like your shoes or your shirt. That is why we are excited to offer you a brighter way to display your smile with colored bands to accessorize your braces. Many think of braces as available in steel only, but there are actually various types of braces. If you choose ceramic or Invisalign, bands may not be a customizable option. On the other hand, with steel braces, the silver brackets and wires will allow for rubber bands to bring color to your braces. Those tiny elastic bands are the key to colorizing your mouth! If you decide that you want to brighten up your smile while wearing braces, then your Webster Groves orthodontist can give you a great set of options. It is always a good idea to have fun with your orthodontic health and encourage yourself to smile brighter every day throughout the process. You may ask: are there really many options to accent your braces? That’s right! The choice is yours. You can stay subtle or be out of the box with bright and vibrant colors. Your band color of choice can actually convey your personality, school, holiday, athletic team spirit, or even your mood. So each time you visit your orthodontic office in Webster Groves, you can select a new vibrant color. Some studies have shown the following correlation between you and your color choice. Purple lovers are often creative, artsy types with a vivid imagination and flare for drama. If red is your color of choice, you may be a motivated, persistent, and passionate individual. Vibrant yellow bands reveal that you are likely a person with a sunny disposition who looks on the bright side in life. Orange lovers tend to be optimistic, friendly extroverts who love to talk and socialize. If blue is your color, you’re likely a calm, sensitive person. The color blue has been known to represent tranquility and spirituality. The color green reveals compassion, intelligence and humility. Lovers of green tend to be level-headed and balanced individuals. You know yourself best, and your premier Webster Groves orthodontist is ready to go over a variety of options for you. The choice is yours, and there are no rules to finding that perfect color combinations. At Borello Orthodontics, we take pride in helping you customize your smile with elastics. Give us a visit to see the variety of colors available, and express yourself with a colorful smile. Our 5-star-rated orthodontist can give you the tools to reach your brightest smile.